For Disneyland in Southern California, there are 3 Disney owned and operated hotels adjacent to Disneyland and all of them offer 24-hour-a-day Disney hospitality. Staying on site gives you an extra Magic hour daily and an exclusive entrance to the California Adventure Park. There are several good neighbor hotels off site that might help fit your budget a bit better. Off-site hotels are nearby but it either requires a good walk or the use of the ART (Anaheim Resort Transit) to go between the hotel and park. If you decide to use the ART, be aware that there is a small fee attached. If you stay off site and purchase a 3 day or longer pass, you get 1 day of extra magic hour. *Most hotels in the area, including Disney hotels, charge for parking. Staying on site gets you to the magic faster. For the Walt Disney World Resort in central Florida you have your choice of over 24 on-site Disney hotels ranging from value resorts up to family villas with full kitchens. 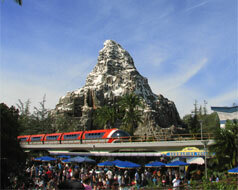 You have full use of the Walt Disney Transportation system (bus, boat and monorail) all free of charge. You also have free access to Disney’s Magical Express that offers free transfers between the Orlando Airport and your Disney World Resort Hotel as well as resort airport check in for your return flight home. As a resort guest, you can go into a park 1 hour before opening and stay up to 3 hours after closing! You also get to pre-reserve your fast pass options 60 days prior to check in. Staying off site can save you some money, but don’t forget to factor in the cost of getting to the Disney parks from your hotel. Few resorts offer free shuttles and for a nominal fee they will take you to the ticket and transportation center where you can travel to any of the 4 theme parks. You can also rent a car and drive to the parks, although you will have to pay a parking fee charged at each resort. Staying off site allows you to sign up for fast passes 30 days prior to check in.